Are you a 4-H’er who will be entering college in the fall 2019 semester? If so – you are eligible to apply for 4-H Scholarship. Scholarships are for any graduating High School Senior in 2019. There are lots of 4-H Scholarships to apply for. Also – please remember if you have a have renewable scholarships, your 4-H Agent needs to register you. Ask your 4-H Agent for the county deadline. They are due Feb. 1, 2019, to the State 4-H Office. 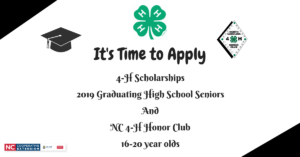 It is also time to get your NC 4-H Honor Club Application ready. Being a North Carolina 4-H Honor Club member is more than just an honor. It is the chance to give back to the 4-H program using the knowledge and skills that 4-H helped you to gain. Honor Club seeks members who want the opportunity to contribute to the club’s motto – Service – by continuing their involvement even after aging out of the 4-H program. Talk to your 4-H Agent about the county deadline. They are also due to the State 4-H Office by Feb. 1.